Yesterday I spent the day with thousands of screaming kids, running amok, stuffing their faces and getting their hands dirty. And I loved it! My 4 year old daughter and I went on the annual pre-Christmas school excursion to Juveandalus 2014 the Feria of Childhood and Youth, in Granada. I managed to wriggle out of it last year, mainly because Little Miss Go GranadaSpain didn’t really know what she was missing, but this year not a chance. Talk of La Excursión was rife on the patio at school and she took every opportunity to remind me that I needed to sign the form and cough-up the money. And why would I want to wriggle out of it? What could possibly be unappealing about a 9 hour day that starts and finishes on the school bus (flimsy sick bags and noisy kids come as standard), which wends its windy way out of the mountains and then hurtles through the vega towards towards Granada, city of the far-more-alluring Alhambra Palace, to spend the day freezing my bits off tailing my 4 year old through a couple of glorified, and poorly heated, sheds next door to Carrefour? Not sounding great on paper is it? *Check out all the FREE activities on offer inside the pavilions before hitting the fairground! 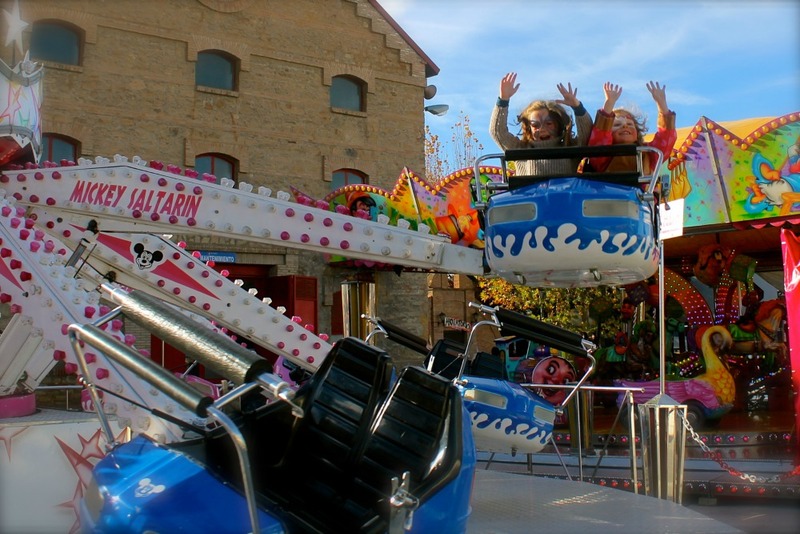 One ride is included in the ticket price and after that they are €2 a pop! But it was FANTASTIC! Running now for 28 years, Juveandalus takes place in the covered pavilions (not really sheds) at the Feria de Muestras de Armilla, and it offers a great mix of fun and education through a wide range of sports, recreational and interactive activities. And there were ponies! More than 100,000 people, and 70 commercial firms and public institutions, participate in this two-week event each year. During the first week Juveandalus is mostly attended by school groups from Granada, Jaen, Malaga, Cordoba and Seville and after that it is more of a family attraction. The highlights for us were the obligatory face painting (though by the end of the day my child was less Hello Kitty and more a tired and emotional Alice Cooper – or do I mean Gene Simmons? 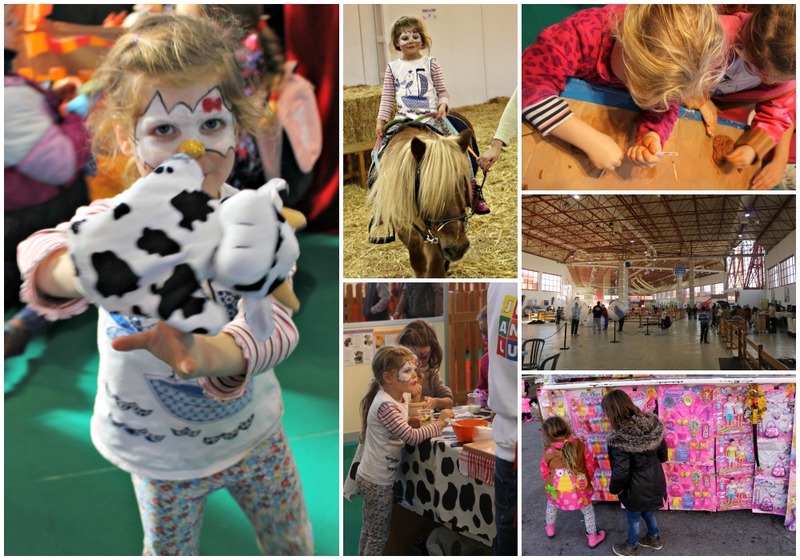 ), pottery, dancing and making healthy fruit salads, dressing-up and hogging the stage at the Bambino Theatro, attacking the many bouncy castles (while the mums and teachers sat and had a natter), the fairground rides, and did I mention there were PONIES? Other attractions include the national police motorcycle display, the Alhambra and Generalife sensory exhibit, the presence of the Granada Lions football and Andalusian (FIBA) winter sports teams, the campaign for responsible consumption of toys, the puppet theatre, Scalectrix, flight simulations carried out by pilots and flight instructors and 80 meter zip line. My jaw also dropped to see that they were also offering free dental screenings. In fact there was so much to do there that the time just flew by. At €4 a head, and children under three entering for free, this is an affordable and unmissable Christmas event for young and old. If you are in Granada for Christmas, grab your child and go! It is easily accessible from the motorway and parking is available close by and you can reach the site on bus route SN5 from the bus station or city centre.